(WIRED) -- With its upcoming PSPgo, Sony is betting that you like "new and shiny" more than you like "money and savings." Sony's new PSPgo is attractive and pleasingly compact, but pricey and not compatible with older games. That's not to say that we dislike it. In fact, the PSPgo is attractive, playable and pleasingly compact. The fourth entry in the PlayStation Portable line is considerably more toteable than its predecessors, with a slick form factor that resembles a slider phone. Measuring in at 5 x 0.6 x 2.7 inches (closed) the PSPgo is about half the size of the original PSP. To access the controls, the bottom section slides forward with with a smooth but firm mechanism that seems sturdy enough to resist clumsy gamer hands. It's small but comfortable, even for those of us cursed with oversized paws: It's just wide enough for the index fingers to curl around the frame, and your thumbs fall into prime button-mashing position without feeling cramped. The face buttons are slightly thinner and more responsive, and the analog nub is recessed into the console's casing, resulting in much tighter control than with earlier PSPs. 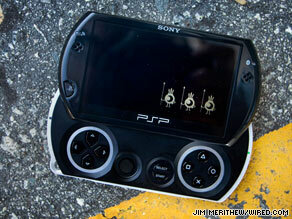 The 3.8-inch screen shares the same bright, gorgeous 480 x 272 pixel resolution of its year-old predecessor, the PSP 3000. The PSPgo also ekes out battery life comparable to the 3000: we got roughly four and a half hours each during extensive web-browsing, music-playing and gaming sessions. New features include Bluetooth support, so you can pair the PSPgo with accessories like headsets, enabling Skype calls or in-game voice chat. Busy gamers will appreciate the Pause Game function, which freezes your game in its current state so you can take a break. You can now also control your PSPgo with a PlayStation 3 controller, which is handy if you've connected your portable to a TV, or are the sort of person who carries a spare Dual Shock 3 controller in your backpack next to the MREs and the water purifier. The UMD disc has been scrapped (woo-hoo!) in favor of digital distribution. That means you can pick up new music, movies, and games wherever you can find a Wi-Fi connection. You can also sync the handheld with a PlayStation 3 or Windows PC, but not with a Mac or a Linux PC (d'oh!). For storage, you'll dump all of the games and media you download onto the PSPgo's 16GB internal flash drive. If you need more space, it supports Memory Stick Micro cards, up to 32GB. There's a lot to like, but current-gen PSP owners looking to upgrade might feel Backdraft levels of burn. The PlayStation Store is the only way to get new games for the PSPgo, and your prized UMD collection can't be converted or ported over. Since re-buying your entire library of games isn't an option for most folks, you'll just have to hold on to your old PSP if you want to play that old copy of Lumines. It gets worse. With classic Sony perversity, the PSPgo abandons the PSP's traditional mini-USB connector, so all of those accessories you've been collecting over the years will be useless with this new gadget. Granted, Bluetooth support widens your options a bit, but buying new accessories for what is essentially the same hardware is tougher to take than a sideways suppository. With a $250 price tag, Sony is taking a real gamble here. Apple's 3rd gen iPod Touch, which is evolving into a real contender in portable gaming, is pricier -- but it's backed by superior features, iTunes music support, the App store, and a legion of smarmy hipsters. Nintendo's dual-camera, dual-screened DSi is cheaper, with a wide selection of critically acclaimed games. And the year-old PSP 3000 will play both old UMDs and PlayStation store downloads, supports your old accessories, and will only set you back $170. In other words, who's really going to buy the beautiful but pricey PSPgo? Only someone smitten by a case of gotta-have-it-itis. The rest of us should sit tight and wait for Sony's hype machine to pass us by, or at least lower its prices a bit.